Genevieve Taylor - BBQ Asian SteakAsia Steak with griddled pak choi, ginger soy dressing and BBQ steamed rice. 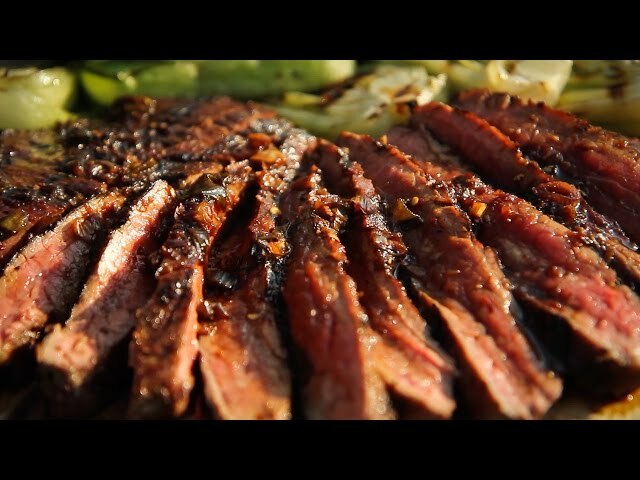 This mouth-watering steak recipe is all about two things – a great piece of beef and that all-important marinade. Whipping up your own authentic ginger-soy dressing really couldn’t be easier, after which you’ll never tire of finding a world of creative uses for it. From steaks to salmon to grilled vegetables and more, bringing the flavours of the Far East into every summer BBQ really couldn’t be easier! One of our favourite BBQ sauce recipes – guaranteed to become one of yours too! 1. Soak the rice for an hour in a bowl of cold water. Drain well. 2. Get the sauce ready to cook by adding all the ingredients to a jug, ready to pour into a hot heat-proof pan on the barbecue (a cast iron skillet is ideal with no plastic handles). 1. Fire up 2 out of 3 of the main burners on the barbecue and leave to heat up for 5 minutes. Then turn on the infrared sizzle zone which will be up to heat in an instant. 2. Put rice pan on the hot sizzle zone, add the oil and drained rice and stir well to coat the grains. Pour in recently boiled water (have a hot kettle to hand) to 1cm above the rice level. Bring back to boil, put the lid on tight and boil for one minute before transferring to the unlit burner to steam over indirect heat – making sure pan handle is turned so that barbecue lid can be closed. Providing you don’t take the pan lid off, the rice will take around 12 minutes to steam to perfection – but a few minutes longer will be fine too. 3. Start sauce by setting the cast iron skillet on the sizzle zone to heat up. When it’s really hot, pour in the sauce – it should bubble pretty much instantly – just let it sizzle for a few seconds before transferring to the middle burner. Reduce the flame to as low as possible and leave to keep warm, stirring once or twice, while you cook the steak. 4. Season the steak with a drizzle of oil, plenty of pepper and a little salt. Sear the steak on the sizzle zone pressing gently all over with the tongs to get maximum contact with the grill bars – a couple of minutes should do it, then turn and grill for about 3 more minutes on the other side. This should give a medium-rare steak, depending on thickness. Cook for another 30 seconds to a minute on each side if you prefer a medium to well done steak. Turn off sizzle zone. Transfer steak to the warming rack above the lit burners and leave to rest while the rice finishes cooking. Brush a little sauce over the steak as it rests. 5. Slice the pak choi in half through the root and drizzle over a little sesame oil. Sear for a couple of minutes each side over a hot grill until tender but still with plenty of crunch. 6. To serve – slice steak, thinly across the grain and arrange on a platter, along with the pak choi. Drizzle over a little sauce. Serve the rest of the sauce separately, along with the rice.